The stock markets have become increasingly volatile over the recent past due to rising US and domestic interest rates, mixed corporate results, bank NPAs, corporate governance issues and many other factors. Volatility makes investors jittery and unsure about their investments. This often results in selling fundamentally strong stocks impulsively or shifting away from long-term holdings to very short term trading calls. As a result, the investor usually faces losses and often decides to exit from the stock markets completely. This is when a discerning investor sees opportunity by remaining invested and even adding to his holdings during dips. Volatility is an integral part of the stock markets. In fact, it provides opportunities to perceptive investors to play on market sentiment and invest at attractive valuations. Volatility should be viewed in a positive manner without allowing your emotions to enter your investment decisions. And always keep in mind – holding your investments for the long term not only reduces investment risk with passing time, but also helps you build serious wealth. 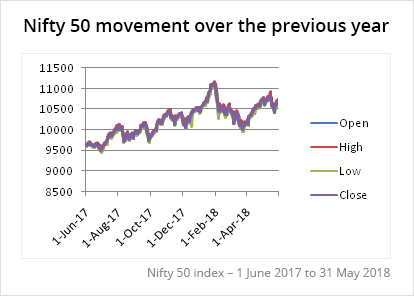 Consider the NSE Nifty movement over the previous year (1 June 2017 to 31May 2018). The Nifty peaked at 11171.55 (on 29 January 2018) and hit the bottom at 9448.75 (on 30 June 2017) during the year, which is a difference of 1722.8 points between the highest and lowest levels. Additionally, the visual shows the spikes (volatility) the Nifty experienced during the year. Volatility is even more pronounced in case of individual stocks. Consider Bajaj Finserv Ltd., a fundamentally strong stock, which experienced significant volatility during the previous year. However, investors who held on to this stock have seen it significantly bounce back to a new 52-high on 11 June 2018 (at Rs 6156.90). Takeaway: Market declines and panics will impact nearly all stocks – some more, some less; you must deal with it to succeed as an investor. In case of fundamentally strong stocks, the impact is even more pronounced. For instance, if you have invested in MRF Ltd. on 1 June 2000 when the stock was quoting at Rs 1378.80, you would today have a 54.9 bagger in your portfolio. Takeaway: Being a successful investor requires you to be disciplined and patient with the ability to keep emotions away from your investment decisions. Let’s say the market corrected by 200 points on the Nifty… it would in all likelihood be traumatic. In fact, you may consider quitting the markets right away. Don’t! Remember, corrections and panics are truly the best opportunities. In fact, the famous investor Warren Buffett once stated that if the market was at near-bottom, he would use the opportunity to increase his positions. Take the case of Dewan Housing Finance Corporation Ltd. (DHFL) which hit rock bottom on 22 November 2016 quoting at Rs 226.95 having fallen from its peak of Rs 330. Investors who had entered the stock then would have now had a 3 bagger in their portfolio. Takeaway: Market corrections provide you with an attractive opportunity to buy at great valuations, which, in turn, increases your stock appreciation potential. A correction is only useful if you have the funds available to increase your positions. In other words, don’t be 100% invested at all times. At the same time, it would not be wise to hold cash beyond 5-10% of your total portfolio. Use this cash to take advantage of opportunities. Additionally, it’s not advisable to borrow to invest in stocks (margin investing). This is dangerous especially in times of volatility. Any short term dips will put you in an uncomfortable position of having to square up your margin positions at a loss. Takeaway: Maintain some liquidity to take advantage of market dips. In fact, greater the volatile, higher the chances of getting attractive entry opportunities. Most investors tend to get influenced by news, rumours, trading recommendations, stock tips… and the short term noise. This results in frequent buying and selling based on ‘the latest update’. A successful investor has the temperament to stay invested and ignore this noise. Once he is convinced on the fundamentals of a stock, he invests and then gives the company time to perform. Takeaway: Build the right temperament to be a successful investor. Buy based on the stock’s strength and not on rumours, tips, etc. To conclude, making an investment decision based on extensive research, deep knowledge of the business and sector the company belongs to, sound assessment of future growth prospects, assessment of the management, etc. is what makes an investor successful. Volatility is the icing on the cake offering attractive entry points for fundamentally strong stocks. StockAxis applies more than 3 decades of the collective knowledge and experience of its team of research analysts to locate companies run by honest and competent management with attractive growth prospects and available at reasonable valuations. Thanks for such analysis. I am getting confidence . Thank you for your appreciation, Sir. Your words motivate us to keep working on such articles. Explained excellently and I learn many things from this . Thank you stockaxis. Excellent information. Thanks for imparting such a good knowledge. Please advise the best ancilliary company of auto sector for investment. To your above query, we have directed your assigned relationship manager to call you and help you with fundamentally good stocks in the auto ancillary sector. Good information for right investor. Any advise of Auto sector, specially Bajaj Auto & Heromotocorp. Thanks. To your query on the auto sector, we believe that the sector will maintain its robust growth rate even in the future, thus the sector is looking very bullish. Bajaj Auto and Hero MotoCorp are fundamentally very strong companies with both trying to grab the market shares. We believe that both the companies are very well placed in the two-wheeler segment. Really fantastic knowledge of stock market. Patience is very important for real investors. Very good suggestion for investor. We also recommend you to read following blog: Using the EV/EBITDA multiple smartly! Thank you for your appreciation, Sir. 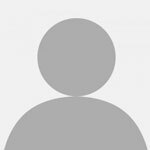 Please visit the following link for more blogs. Good guidelines for investors.I experienced the same in volitile market.Now i can take bebefit of volitile market instead of selling my shares in dip. Thank you for your appreciation, Sir. We recommend you to visit the following link. Nice Article for fresher who would like to enter in Stock Market. Thank you, Sir, for your appreciation. We recommend you0 to also read the following article. It is really a nice article which gives insight how to remained patient in volatile market and also advise to have surplus liquid funds in case of correction in market. Thanks Stock Axis. Very nice summary to educate the investors who really sell in panic, which should not be the case. It is very good article For the knowledge of the investor. To know the fundamental of the company data from where to be collected that includes past performance and future Plans Is there any website. Please help. Thank you for visiting us and believing in us! You can visit our website www.stockaxis.com and use analyser to get information regarding any particular company. To know future plans we recommend that you can refer to company's website or their annual booklet. Thank you for such nice article and rules. It really matters. I am subscriber to multibegger services. Thanks for your views on volatility and detailed explanation with graphs which has come at the right time to make right decisions. By going through this article one can shed his doubts/suspicions about volatility in the markets and how those situations can be utilised to build up your portfoliobeneficially.profusely thankq. Thank you for visiting us and believing in us! We will always strive to make your experience better.